UNCASVILLE, CONN. – May 15, 2017 – Barrett-Jackson is kicking its 2nd Annual Northeast Auction into overdrive with a full week of collector car activities, events and unparalleled auction action. Building on the momentum from last year’s first double sellout in the company’s history, The World’s Greatest Collector Car Auction® is fueling the enthusiasm of the collector car hobby across the Northeast with its premier automotive lifestyle event at Mohegan Sun in Uncasville, Connecticut, June 21-24, 2017. Barrett-Jackson will rev up for the week of activities as the title sponsor of the New England Concours d’Elegance, which begins Saturday, June 17. Additional events and activities will continue through the week, culminating with the highly anticipated auction at Mohegan Sun. 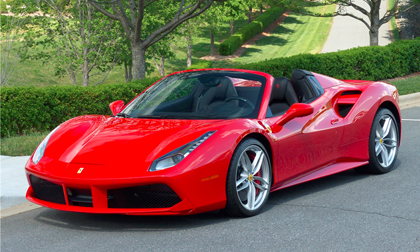 Consignments are already pouring in for Barrett-Jackson’s Northeast Auction, including one of the world’s most desirable supercars, a 2017 Ferrari 488 Spider (preview), which can only be purchased outside of this auction by joining an extensive waiting list. This Corsa Red prancing horse has only 77 miles and features a power retractable hardtop, 3.9-liter V8 engine, 7-speed F1 dual clutch transmission and over $90,000 in optional equipment. Also crossing the block is an incredibly rare ’70 Ford Mustang Boss 429 (preview). With a fresh restoration and only 10 test miles on the odometer, this Grabber Blue Boss 429 is an extremely coveted Mustang and includes the Drag Pack convenience group, competition suspension and 429 Boss engine with 375 horsepower. The Northeast Auction will add more examples of American performance and design to the auction block with a ’66 Shelby GT350-H Fastback (preview). One of only 59 built in Ivy Green, this authentic Shelby was completely restored in 2010 and is fully documented in the SAAC Shelby Registry. Also on the docket is a custom ’66 Corvette Pro-Touring Convertible (preview), which is a ground-up build on an Art Morrison chassis. Under the hood is a ground-shaking LS3 engine with a custom forced-intake manifold mated to a 5-speed manual transmission. The interior is completely new and Dyno-matted from the firewall back. Auction guests will also see a European take on performance with offerings that include a ’88 Porsche 930 911 Turbo Cabriolet (preview) with a factory slant nose. This Porsche features a 3.3-liter engine with 4-speed transmission and includes the original Fuchs wheels. Established in 1971 and headquartered in Scottsdale, Arizona, Barrett-Jackson, The World’s Greatest Collector Car Auctions®, is the leader in collector car and automotive lifestyle events, which include authentic automobilia auctions. The company produces auctions in Scottsdale, Arizona; Palm Beach, Florida; at Mohegan Sun in Connecticut, and Las Vegas, Nevada. With broadcast partners Velocity and Discovery Channel, Barrett-Jackson will feature extensive live television coverage in 2017, including broadcasts in over 100 countries internationally. Barrett-Jackson also endorses a one-of-a-kind collector car insurance for collector vehicles and other valued belongings. For more information about Barrett-Jackson, visit https://www.barrett-jackson.com or call 480-421-6694. Owned by the Mohegan Tribal Gaming Authority, Mohegan Sun is one of the largest, most spectacular entertainment, gaming, dining and shopping destinations in the United States. Situated on 185 acres along the Thames River in scenic southeastern Connecticut, Mohegan Sun is home to three unique casinos, 1,600 deluxe hotel rooms, 2 world-class spas, a golf course, over 80 shops, restaurants and bars as well as three award-winning entertainment venues including a 10,000-seat Arena. Mohegan Sun is within easy access of New York, Boston, Hartford and Providence and located 15 minutes from the museums, antique shops and waterfront of Mystic Country. More information is available by calling 1-888-226-7711 or visiting mohegansun.com. Connect with us on Facebook, follow us on Twitter and Instagram @mohegansun, view us on YouTube and find us on Snapchat at username MoheganSun.